SUVs are popular among drivers for many reasons, ranging from its capabilities to its spacious interior to its available features. 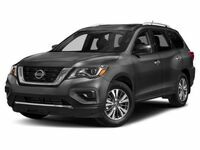 The new 2019 Nissan Pathfinder is no exception to these advantages, if anything, it adds more for drivers to enjoy. For instance, it is equipped with a powerful engine that puts out up to 284-horsepower and is paired with Nissan’s innovative Xtronic CVT®. Plus, you can choose to add the Intelligent 4-Wheel Drive system for extra control while driving. And most impressively, the 2019 Pathfinder is able to tow up to 6,000-pounds when properly equipped, making a family camping trip a breeze. You can also take advantage of the selectable driving modes, Hill Start Assist, Hill Descent Control and the available Advanced Drive-Assist® Display. Then, you can also use the flexible interior to make transporting items easier, such as the fold flat floor, under-floor storage in the cargo area, LATCH AND GLIDE® technology and EZ FLEX® Seating System. Besides its impeccable driving ability and convenience, there are number of great features that come standard or are available on higher trim levels. Some of the more stand-out features include the various Nissan Intelligent Mobility suite of driver-assistive technologies, such as Automatic Emergency Braking, Intelligent Cruise Control and Blind Spot Monitoring. Along with the different safety features, there is also the NissanConnect® services that are powered by SiriusXM®. This includes features and services with Amazon Alexa™, Google Assistant and Remote Access on your compatible smartphone. You can also add in the Nissan Navigational System, Rear Door Alert, available Intelligent Around View® Monitor and the family-friendly Tri-Zone Entertainment system. There are also the standard USB charging and music compatible ports, Bluetooth® connectivity and easy-to-use, 8-inch touchscreen display. And don’t forget about the available Motion Activated Liftgate, Nissan Intelligent Key®, tri-zone automatic climate control, heated and cooled front seats and heated outboard rear seats. 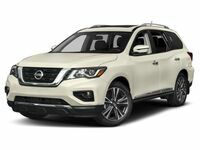 For more information about the 2019 Nissan Pathfinder, or to arrange a test drive, you can contact us online or by calling 956-295-3028.